I lost a lot of hair after surgery due to infection, high fever, and stress. A vinegar rinse every three days before shampooing stopped the hair loss right away and hair started growing back. I continued this for three months. Natural solution for alopecia areata. Quarter cup to a cup of water. I've been successful with steroid injections for alopecia areata. I have had alopecia areata (AA) since age 7. I fought off bald spots for over 20 years then around 30, all of 90 percent of my scalp hair and eyebrows fell out. I was beyond devastated and tried everything. It wasn't until all of my bones and joints started deteriorating at 36 that I was diagnosed with multiple arthritis types and auto immune disorders. I was put on immunosuppressive bi-monthly injections (Humira and methotrexate) and medicines such as sulfasalazine. After about 3 months 70 to 80 percent of my hair grew back; it was like a dream! It's now been 2.5 years and as my arthritis and immune system worsens I have lost substantial hair again. I still have about 50 percent but no eyebrows or eyelashes. Hoping that a stronger injection and immunosuppressive drugs calms my system enough to stop attacking my follicles. I've had knee, hip, wrist, neck, jaw (any joint) surgery, as well as spinal fusion of L5 S1. With all of that I have enjoyed that my hair did come back after so many years, so I am hopeful I can suppress my immune system enough to get my hair growing again. Keep up the good fight my friends. I use Rogaine for my alopecia areata since I first started losing my hair in 2012 from work stress. Today, I still lose my hair after Rogaine grows it, my hair gets brittle and falls out. I don't know if this is normal or if I'm shedding because some hair remains. I have body hair too. Alopecia areata certainly is a hard condition to live with. My doctor did find a cure for losing eyelashes. Bimatoprost Actavis gave me lovely long eyelashes again and quickly filled in the gaps. It is intended for glaucoma. It won't fix the hair on my head, but it was nice to get my eyelashes back. I struggle with social anxiety, it is very difficult to get me out of the house for anything other than work and supermarket shopping. I have stopped playing golf and other sports, hate being stared at. It appears there is no single cure for alopecia areata. I have suffered from alopecia areata many times over the last 10 years or more. I have cortisone injections done in the affected spots, the hair does start growing back quite quickly. Your dermatologist should be able to do this for you. I've had alopecia areata for 8.5 months now. I have had cortisone injections into the scalp and cortisone lotion (which ruined the texture of my hair). I've done laser acupuncture, also taken supplements like Laminine, Biotin, magnesium chelate, an immune-system balancer, Hairpro, and calcium/vitamin D and zinc. Nothing has worked and I have so little hair left. I am now taking Minoxidil and dexamethasone in a last ditch attempt. I have been suffering from migraines the last few days which I don't normally do. Like others I am devastated from this horrible thing." I rarely get bald spots, my first was in 1993, and I'm on my 4th. For my 2nd and 3rd bald spots, my doctor gave me some kind of corticosteroid shots in the bald spot and the hair regrew quickly after that. (I'm living elsewhere now and haven't found a new doctor yet.) My experience is that, like with any auto-immune disease, stress exacerbates alopecia areata. My bald spots have appeared at times of stress. I suspect my grandmother had alopecia and I inherited it from her. I am 54 years old and experiencing alopecia areata since last year. I had a sudden period of extreme stress that may have prompted the loss, but had also tried a medicine for a nail fungus around the same time. I see one doctor (a rheumatologist) for a possible lupus diagnosis (lupus is difficult to diagnose) and my primary care doctor was also treating me for hypothyroidism since I was gaining weight, and had increased my dosage from a very low beginning strength to a slight increase. With all of that going on I am not sure what the exact cause of the hair loss was. I stopped all medications immediately. I jokingly told my doctor that I can handle being fat, I"m ok with getting old, but old, fat and bald wasn"t going to work for me. My other doctor did some blood work and suggested I take zinc supplements, and things improved. The nail fungus went away, my hair started re-growing, and I perked up a little despite being off the thyroid medicines. Just this week I noticed a quarter sized spot which is increasing in size, and I"m back online searching for answers. The only changes this time is that I had changed brands of zinc, maybe it"s time to go back to what was working. I have alopecia areata and I have yet to go to the doctor to do blood tests, but I noticed a small bald patch on top of my head a year ago and I did nothing. Then this year it looked bigger so I started to massage my head at night and twice a week use an oil therapy that I massage into my head and sleep with. The next morning I shower and my hair feels soft and my scalp feels good. The oil treatment consists of jojoba oil, coconut oil, almond oil and tea tree oil. Within two months I noticed little tiny hairs growing. I am not sure if this will work for everyone but I do believe for some this disease is a sign of a malnourished scalp. Massage the spot in the shower and before bed. Hope it works for you. I'm 27 and I got alopecia when I was 23 years old. I couldn't stop crying and then a friend of mine offered to take me to go see a doctor and I was told most people get it because of stress that our body feels and hits areas on our head. Being a girl I think it's more stressful because we have long hair and sometimes my spots became noticeable even if I used pony tails. I was given a lotion and some zinc and iron tablets and tried OTC shampoos as Folicure/Pony/Chile and I even used iodine. The doctor told me to rub iodine around it then use the lotion that was given and I had best results with the Folicure shampoo products. I buy them at HEB; they even have tablets and oils and powders and vitamins, all for the hair loss and you'll see awesome results. My doctor told me I can try getting on a diet too and to walk every day and relax and to try to not let things bother me so much. My son has been suffering from alopecia areata for 3 years. I have done many cures for him but nothing with good results. First time a dermatologist gave my son 10 mg/day prednisolone, 5 mg/week methotrexate, 5 mg/week Folsafe. After one month therapy everything was ok, my son gained back all the hair, and in the third month, the hair began to fall. I repeated the same cure one year after. It was the same situation. Now he has nothing unfortunately. I'm a 23 year old woman and I discovered I small patch of alopecia areata on the side of my head about a year ago. I went to the doctor got the shot treatment but it made it worse. Now the area looks and feels really sensitive. I have tried oils and cream but it seems like it is getting worse, nothing has helped. My mother had alopecia areata, I noticed the loss two years ago at 40, I stopped wearing weaves, and I'm taking hair, skin and nail vitamins. After six months I noticed the loss process has stopped and hair started to grow back, it is extremely slowly though. I"m looking for vitamins that can help, I hear Biotin is good. I have alopecia areata. I consulted with one dermatologist and he gave me the hair bless solution to apply on it. But nothing worked. Then I moved on for Ayurvedic medicines. I applied Navratna oil, black sesame oil and neem oil and left it overnight. After ten days of application it worked and now I see a patch of hairs on the bald patch. Also at the same time I was taking Dr. Reckeweg"s R89 for hair problems. You can take 20 drops twice or thrice daily along with Kali Sulphuricum (4 tablets twice daily) and arsenicum album 30 (4 drops twice daily). Alopecia areata is an auto immune disease, so you need to cure your immune system. It is because of blood impurity and 'pitta dosha' in Ayurveda. So take gooseberry, butter, curd, cold milk etc., avoid taking tea, coffee or any hot food. Avoid taking spicy food or food from outside. You need to balance your 'pitta'. I am also taking triphala to control the 'pitta' which also boosts immunity. Hope you people find it useful. I am a 32 year old female. I first saw two bald patches on the top of my head back in September of 2013 (I felt like I had died). I"ve always had very long hair so this was devastating to me! I started receiving the shots in my head and it made my hair way worse, every time I had gotten the shots, a new bald spot would appear. I found a bald spot that me and the doctor had seen and was growing hair without any treatments (no shots or any creams). I"m choosing not to get the shots anymore and see what happens! Stress is my biggest issue I guess that"s why this happened to me. I'm a female and started losing my hair at 25. I'm 30 now and my bangs are almost gone as well as the crown of my head. I tried and failed with Rogaine and some other shampoos. I now wear extensions stuffed underneath my hats and I'm so embarrassed every time I go out that people notice my fake hair. I haven't gotten the courage to wear wigs outside yet. But I heard today from a friend of my mother's who is a registered nurse who used to have the same problem as me and then just before she started chemotherapy for her cancer she found a solution. She takes a month's supply of birth control pills and mushes them into powder, and then mixes it into her shampoo. She never lost her hair during chemotherapy and to this day she has long thick hair. Bald patches began at age seven. Cortisone shots directly into the patches worked temporarily. When patches came back around age nine I was treated with: more shots in scalp, Topsyn ointment and also fluorescent light treatments. Eventually all of my hair fell out. By age 15 I was asked to participate in the Minoxidil study. I used it at (what is now considered to be) 100x current market strength. It did not work for me. By age 17 my eyebrows fell out. By age 23 my eyelashes, once lush and long, also fell out. Half of my mons is also bald--the rest is pale blonde and thin. I have transparent hair growth under my armpits and shave it off once every ten days or so. I haven't shaved my legs since I was thirteen. I am now 41 years old, married, and have two children who do not have this disease. I wear a wig, and every day is hell for me because it is not comfortable. I just want my hair to grow back, once and for all, so I can feel normal again. I have never settled and gotten used to this, but I've made the best of it from what I have. I'm 32 and I've had 4 battles with Alopecia Areata. Every time something major happens I begin to start loosing a patch of hair. First, when I made a huge move across country and left all my family, a spot started. (pretty scary) since it was the first time. The second time, I was in some financial problems, and again it started. The second times, I had deaths in the family a few years apart, and again, the patches came up. It's a horrible feeling to have a full head of hair, and then all the sudden a small little patch starts and you start praying that it stops or doesn't get that big. Currently, I have two huge spots on the back of my head that barely have any fuzz at all. In fact, some of the grey hairs stayed, and the brown didn't. Weird. I'm not on any medications since the other times it grew back fairly quickly (6-9 months), but I think I'm going to find something this time since their much bigger than before. I am a 50 yr old female having had a radical hysterectomy almost exactly one year ago. I had experienced alopecia areata when I was 10 years old, due to a stressful emotional experience. My parents had divorced. I had steroidal treatments consisting of creams and painful injections in the scalp, which did not help. I regrew my hair on my own, but it did take a year. I had healthy hair up until a few weeks ago when I tried to stop taking my estrogen, (hormone replacement) and also experienced yet another stressful emotional episode. I lost a lot of my hair under my existing hair I went to the dermatologist once again to get the same treatment. It is helping somewhat. I have some growth under my existing hair. Autoimmune disorders are extremely hard to pinpoint. I am trying to now to be more positive and not worry about the small stuff and hopefully my hair loss will not be permanent. My suggestion to others who have experienced areata recently is it will take time to regrow your hair back, try to be patient. I am doing my best and pray every day to be at peace. My alopecia first started two months before I conceived my son who is now 5 years old. My hair grew faster after I had my son. I used an ointment and herbal oils, which also helped a lot. There were times when I oiled my hair whenever I had to wash, so every two days or so. After giving birth and weaning my son, I got cortisone shots when the hairless patches recurred. Whenever I would have a disagreement with my husband over something, my scalp became itchy, the hairless patches appeared again. Recently when we were at the verge of a divorce, I had four hairless patches. I saw a dermatologist, and he gave me the cortisone shots again, it stimulated the hair growth. He also gave me an ointment that soothes my scalp. I think alopecia areata is mainly related to emotional stress. I am trying to be positive, and have become more close to God by praying regularly. That helps me calm down and release my stress. I hope someone can benefit from this. I am a 22-year-old woman who has had signs of alopecia areata since the age of 4. I only had it for a year or two, my parents told me, but then it disappeared until high school when I began losing and re-growing one small patch on the front of my head. In my second year of university, I lost so much hair that I had to start wearing a wig. I tried many treatments, but the only thing that worked for me effectively was minoxidil treatment (Rogaine). I encourage everyone with alopecia areata to try an extra-strength solution of Rogaine, which is 5% in strength. After six weeks of using it, I began to grow peach fuzz on most of my balding spots. I had extensive hair loss, so it took me a couple of years before I could go without a wig. Just be patient, and it may come to work for you also. I about 8 years ago lost big patches of my hair. I was almost completely bald. I went to a dermatologist who treated me with fluocinonide solution. She also advised me to not wear a wig if possible. As hard as it was I did not wear a wig, now I have a full head of hair to the middle of my back. I do have Graves Disease and suffer from Hyperthyroidism, but I have not had any hair loss. For my husband homoeopathy drops work well and he gained back all the lost hair. He has had alopecia areata for 13 years, off and on. My son turns 3 in a month's time. When he was only 18 months old I noticed bald patches in his hair, and as the weeks went by they were getting bigger. Then one afternoon he had a nap, and as he woke up all his hair was left on his pillow. We are trying for our general physician (GP) to refer us to a specialist but it's proving harder than we expected. Our GP has told us that it is alopecia areata but we haven't had so much as a blood test, I'm desperate for some answers. My granddaughter, 13 years, is a patient of alopecia areata since 7 years. Her hair of head, body and eyebrow has been completely lost. She is under regular treatment and since there is no effect the whole family is much worried about her. She is very good in her education and now she is facing a complex and hesitates to mix with others. I developed alopecia areata 29 months ago. It started when I had Sertraline and Sulpiride antidepressant. I have had alopecia for almost 4 years and I was given steroid injections in my scalp to speed up the hair regrowth process and it didn't work for me. 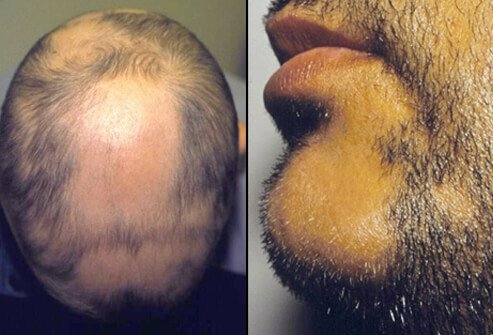 Alopecia areata is from destabilized control of latent Epstein-Barr virus (EBV). Check CD4/CD8 ratio and latent EBV antibodies levels. I'm sure you will find imbalance. In my case it's from tonsil removal and decreased CD8 count and small intestine EBV colonization. Sadly no medicine yet for me, only current possibility is experimental treatment with cloned CD8. My alopecia started when I was 19 years old and I had 2 bald spots at that time. I've done the injections which worked and about 4 months later I had 2 new spots. I'm now 24 years old and haven't had a spot in 2 years but today as I washed my hair I noticed at the crown of my head a little piece of hair that look as if I had another spot and hadn't noticed it and it's starting to grow back and I just got depressed; not again! I'm also natural, I don't use any chemicals on my hair. Since my last 2 spots I cut all my hair off and went natural and to see that little piece of hair bothers me. I thought it was over for me for a little while longer but I guess not and I will be seeing a doctor soon. My alopecia started six months ago. My father had it five years ago and found the shots to help. Originally, the spots were only dime-sized. After using Rogaine for two weeks, the spots widened to the size of my fist. I have tried cortisone creams, which didn't help. I am seeking the advice of a dermatologist. The only treatment that I have ever found to be effective for my alopecia is the use of wigs, as awful as this may be. It does provide a sense of security and some sense of self-esteem. My whole life has been changed as result of this, and I am not the person that I would be had I not been cursed with this disease at the age of 12. I am now 52 years old and have never had my hair done, dyed, ironed, colored or put in a ponytail. I dream about that day and refuse to give up until there is a cure. I am 40 today and have been fighting alopecia for more than 20 years. I've had it since the age of 18. After my first encounter, I was fine for more than 10 years, and then it reoccurred. I tried the same method of the steroid injections, but this time I added the Regenix treatment, which was the application of hair tonic and shampoo to the mix. This remedy cured me for another seven years, and it has been revisiting occasionally every few years. I am 26 years old and have had alopecia since I was 10. It started with a small round patch on the top of my head. I have used several medications that actually have worked. The first time it happened, I had the injections and a cream. It grew back. Then in high school, I had more hair loss and used a cream, which also worked. I haven't had a spot for 10 years, but now I am experiencing the worst hair loss yet. I have taken Prednisone, and now my dermatologist has given me this Ditro-scalp cream to take. It caused redness and irritation on the affected area. I still see hair fall out when I shower and comb my hair. I just hope someday there will be a cure. I'm 40 years old and have had alopecia for more than 20 years. Up until the last year, my hair would grow in spots. I decided last year I was tired of the wigs and showed the world my bald head with a little peach fuzz. I have since lost even the peach fuzz with no hair in sight. I hope they come up with a treatment that works, but if not, I have come to grips with the fact that I may never have a full head of hair again. Personally, I think hair is overrated. I was diagnosed with alopecia areata in high school. It has been very difficult for me. Wearing a wig to basketball practice and running track was not in the plans for me. I have spent thousands of dollars in different medicines and treatments but have not found anything. Now that I am married, I am very uncomfortable letting my husband see what is underneath my wig. I hope that one day there will be hope. Anyone with alopecia should be screened for Celiac Disease an autoimmune disease relating to gluten intolerance (gluten found in wheat, rye, and barley). Celiac can cause alopecia and there are web sites that give more information. Look up Celiac and Alopecia on a search engine. Female big bald spots (on the top of the head) run in my family. It was very disconcerting when I was in my 20's...lots of hats, bandannas etc. folks asking if I had under gone chemo. Then I thought, thank god it's not that! Things could be a whole lot worse than what I was dealing with. It's no fun with alopecia, but you grow into it and make the best of it and remember your blessings. I'm not uncomfortable going bare headed, but I still wear lots of hats. I Love them! I have very unique ones purchased as souvenirs and gifts. I started getting patches of hair loss about 15 years ago and repeating every 2-3 years. In the beginning, a dermatologist treated it with steroid shots. Over time, I stopped getting treatment for the patches due to side effects. My last occurrence was about 4 years ago. I did nothing and my hair grew back in 4 months. Sites of the steroid treatment on my head have thinner hair. It grows slower than the rest of my hair if at all. I, too, have Graves Disease as well as Graves Eye Disease. I have been told the alopecia are at a may be connected because it is an auto-immune problem like Graves. I've had alopecia areata when I was 23 and now ten years later I have it again. It comes on usually when I have extreme stress. However this latest bout I cannot identify what is the stress factor. What I know is that alopecia is one of the most emotionally painful experiences I've had to endure and of all the dermatologists I've been to all seem clueless. I've been to a trichologies and she was the only one that offered some glimmer of hope. With my alopecia areata, I also got bald patches. Now it seems to be growing back. I'm currently using coconut milk on my hair before I shower and it seems to be working well. I hope it grows more. I think my AA may be stress-related. I have job fatigue and emotional stress. Nine years ago, I started getting small patches, which very quickly became one large patch on my back right-hand side. No treatments ever worked. Five years into it, I started rubbing baby lotion onto my scalp, not as a cure, but because my skin was so dry. For some reason, hair growth started within about two or three months. It was thin and grey. Twice since then, a small patch on the back of my head has returned, but after treating it with baby lotion, it was cured within five months. I have not had alopecia now for three years. I was diagnosed with alopecia areata at 8 years old. I saw at least 10 different doctors in three states and they said nothing can be done for me. Now 17 years later, I have alopecia totalis and no autoimmune issues that can be found. I am finally starting to get some hair back, but it is only short blond peach fuzz if you will. It is almost as if I am an infant again and starting from scratch. I have worn a wig since high school as teenagers can be very cruel, and I would not have been going to school if not for the wig. I just want a dermatology clinic in my area that actually knows what they are doing and can help me. I had a total hysterectomy last year and I have been on hormone therapy for the past 9 months, now I'm starting to notice balding patches in back of my head. Could this be caused by hormone therapy or lack of?